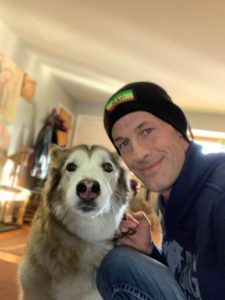 UPS driver Ryan Arens was delivering packages in Bozeman, Montana when he heard a dog in distress and decided to take action. He joined a man in a boat trying to save the pup, and swam to the dog in the frigid water to save her. Arens and the dog, whose name is Sadie, took a hot shower together to warm back up and Sadie was shortly returned to her owner. Later, Arens delivered a package to her owner, and Sadie remembered her savior and happily greeted him. Read more. After their controversial win against the Saints, the L.A. Rams are headed to the Super Bowl with the first two male cheerleaders in NFL history to cheer them on. In 2018, Quinton Peron and Napoleon Jinnies became the NFL’s first male cheerleaders, and they have found Rams fans to be a supportive and welcoming bunch. Since joining the Rams, the two cheerleaders have inspired other men to get into the sport. Peron and Jinnies are excited to cheer for their team at the Super Bowl in Atlanta, and Peron is confident that the Rams will be victorious. Read more. After her mother, an FDA employee, was furloughed when the government was shut down last month, 11-year-old Bella Berrellez decided to start her own business, called Bella Sweet Scrubs, to help support her family and others. Bella makes sugar body scrubs by hand and sells them to neighbors, friends, and people all over the country through her Etsy store. She also prioritizes giving back: Bella donated $100 that she made to Nourish Now, a nonprofit that provides hungry families with food. The young entrepreneur’s other business endeavors include slime and jewelry, and she hopes to expand Bella Sweet Scrubs to lip gloss and soap. But for now, Bella just hopes that her mom will get to go back to work soon. Read more. Jamie Hendricks, a native of Minnesota put “love thy neighbor” into action with her free food pantry. Hendricks noticed the Little Free Library cabinets around town and realized that she could do the same thing with food. 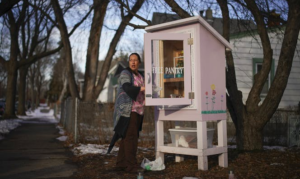 So, she erected a pantry on her front lawn and regularly fills it with food and toiletries so that her neighbors in St. Paul can take what they need, no questions asked. As someone previously affected by hard times, Hendricks knew firsthand how difficult it can be to pay for food. St. Paul Public Works has followed Hendricks’ lead, setting up a Community Cupboard. Hendricks only has one rule for people who use her cupboard: “Leave some for others who come after.” Read more. New Yorker Terry Brubaker was on her way to do some errands when she noticed a strange sight… numerous bills floating in the air. She pulled over, collected the money, which totaled a whopping $6,600, and took the bills to her local police station. In the end, the money was returned to its rightful owner—a woman who had accidentally left the envelope on the top of her car. Read more.